What's 'wrong' with this SCENE? The latest Nile Magazine features Egyptian photographer Manna Nader, who is on a mission to share Egypt's rich cultural heritage to people around the world. This is one of Manna's photos from the feature, from the tomb of Irynefer (TT 290) in Luxor. Irynefer served under two kings: Seti I and Ramesses II, ca. 1279 B.C., helping build the secret tombs in the Valley of the Kings. This scene shows Irynefer drinking from a pool of cool, fresh water beneath a Dot palm tree. It belongs to a spell for 'drinking water in the necropolis' in the ancient 'Book of the Dead'. The Egyptians are famous for their art style; particularly the ‘walk-like-an-Egyptian’ way of portraying people. Each artist's goal was to show each feature on a person as fully as possible. To do this they pictured different features from different points of view – either frontal or in profile. The same goes for outdoor scenes: everything was shown from its most recognisable angle - or the perspective in which they could add the most detail. This artist responsible for this scene in Irynefer's tomb applied some unique artistic licence to make it 'work'. The pool is seen from above to display it fully. Irynefer however, is shown in profile, enjoying the refreshing water. Interestingly, his right arm ends in his left hand, to display the thumb clearly. Irynefer kneels on the bank on the far side of the pool so as to not obscure the water. For balance, the palm tree grows on the near side of the pool, however to avoid having the tree block out Irynefer, the artist has it going behind him. Clever. To see more of Manna Nader's amazing photography, check out the latest issue of NILE Magazine. 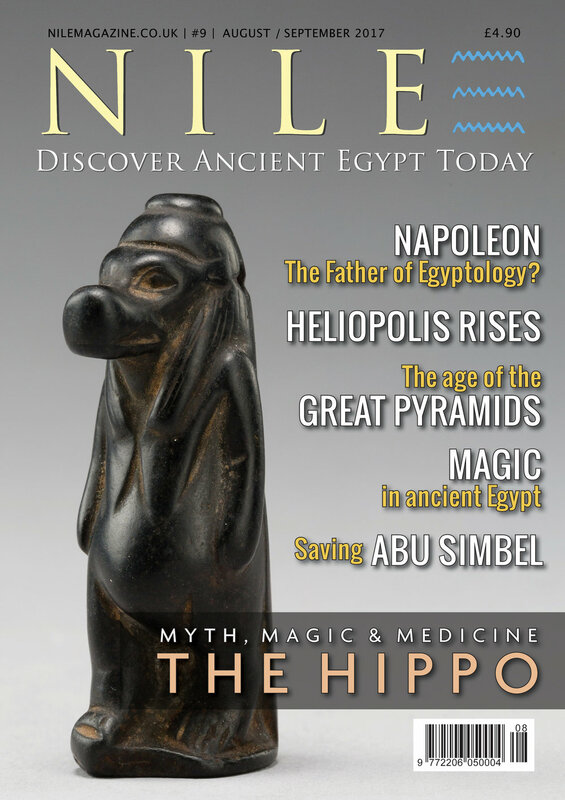 Visit the 'NILE Store' page to download yours today.